In conjunction with the current New York three museum exhibition on the career of Robert Moses, theparkwatchdog.org presents a review of where the park has been, where it is now, and where it is going in the future. 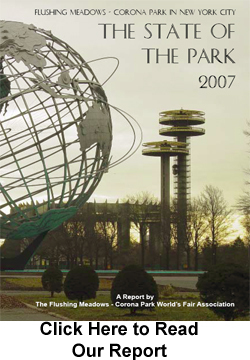 It was 76 days since we delivered our 40 page "State of the Park Report 2007" on the conditions in Flushing Meadows - Corona Park to Mayor Michael Bloomberg, Parks Commissioner Adrian Benepe, Queens Borough President Helen Marshall, and the Park Administrator. (Report can be found on this site above). We have yet to receive a response or even an acknowledgement of its delivery from the Borough President, or the Park Administrator. However, Parks Commissioner Adrian Benepe did react to our report in a published New York Daily News article stating that our organization "has done nothing for the park." Our rapid response to his statement is contained here, including a time line of our Association's 40 year record of fighting for this park. His second response which was received on March 9th said, "We appreciate your time in preparing this detailed report, and we share many of your goals." However, he had no comments about our concerns or proposals and he said he forwarded it to Estelle Cooper, his Administrator of the Park, and Dorothy Lewandowski, his Queens Borough Commissioner for their assessment and recommendation. The problem is, he is delegating it to the very people our report holds responsible for the deplorable decay of this park. Mr. Parks Commissioner, what exactly do you do? We addressed this to you because there is a problem here, and you are now handing this over to the very people that we suggest are the problem! We suggest you get back and sit at your desk and go to work and to answer this report and not pass it off to your incompetent underlings. We are still awaiting substantive responses to our report. Our clock stopped counting at 76days, Mr. Mayor and Mr. Parks Commissioner! We have never received an adequate response to our report. 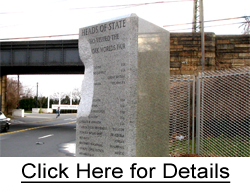 It had been 98 days since theparkwatchdog.org discovered (September 20th, 2006) that the Heads of State Monument was toppled by a speeding vehicle. The Heads of State Monument was only put back at the end of December 2006. However, theparkwatchdog.org discovered that in the process, the incompetence of the Parks department destroyed the monument. THE LIGHT WAS OFF... AGAIN!!! And we were counting down... again! 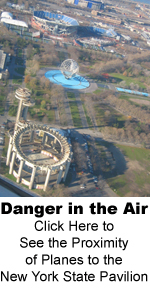 On Friday, December 1st, theparkwatchdog.org discovered that the red aviation warning light on top of the New York State Pavilion was OUT again! -- this, during a weather and wind emergency. It was 5 days that the warning light was out for the second time. Previously, it had been 13 days since theparkwatchdog.org notified (October 13th, 2006) NYC Parks, the F.A.A., and the media that the red aviation warning light on top of the New York State Pavilion was OUT! Federal law requires that the F.A.A be notified within 30 minutes of this safety critical warning light outage. Previously, the light was off for over three months. Only when theparkwatchdog.org reported this problem was action finally taken 13 days after theparkwatchdog.org notified the public. To put the light back on the last time, the parks department had to hire mountain climbers to put the light back on -- how much more costly to the taxpayers will the failure of the parks department to maintain The New York State Pavilion be? 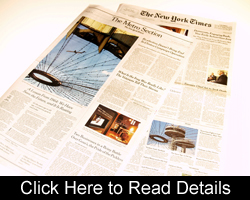 On November 11th, 2006 our campaign to save the New York State Pavilion made the front page of The New York Times as well as the front page of its Metro Section. 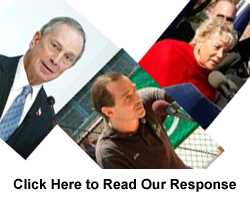 To read the New York Times article and read our proposal submitted to Governor-elect Elliot Spitzer to take back this historic structure from the failed City Parks Department, click to read the details. 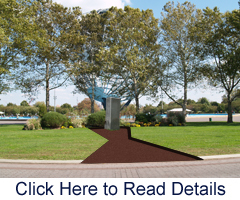 The recently toppled Heads of State Monument in Flushing Meadows must be restored and our Association has a proposal that will bring its history to life. Our proposal has been submitted to the Parks Department and the Queens Museum of Art - and to the public for serious consideration. 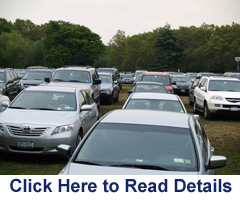 The City's contempt for Flushing Meadows - Corona Park could not be more evident than in the desecration of its parkland by turning this precious space into nothing more than a gigantic parking lot. Our park Association demands that this outrage stop. The Willow Lake section of Flushing Meadows is one of the treasures of this park and also one of its most forgotten and neglected. Our Association has long fought to preserve and protect this wildlife and natural gem. The Queens Tribune has now exposed the shameful conditions of this park resource. We present here their recent investigative report and editorial. 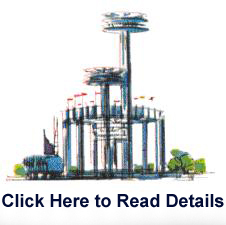 The New York State Pavilion in Flushing Meadows, designed by famed architect Philip Johnson as a $12 million dollar structure at the 1964-65 World's Fair (today's cost would be estimated at $78.6 million) was considered one of the jewels of the fair. Retained for the post fair park, the structure has been neglected, abused, and allowed to deteriorate by the Park's Department over the years. Bill Young, whose magnificent website nywf64.com has detailed through theparkwatchdog.org the scandalous story of how this structure has come to the disgraceful condition it is in today. We present here his detailed report on the history of this pavilion's scandal. Note: as time and webspace permits, we will install what amounts to significant archives on these efforts to this site. The Olympics Proposal and the World's Fair Proposal had dedicated websites. As time permits, these sites will be syndicated here.